Preheat the grill to medium high. Boil the potatoes for 18–20 minutes, until tender. Heat 1 tbsp olive oil in a frying pan and add the leeks, garlic and leaves from 2 thyme sprigs. Season and cook on a mediumheat for 5 minutes, until soft. Spread out in a roasting tray. Place 2 thyme sprigs on top of each haddock fi llet and season. 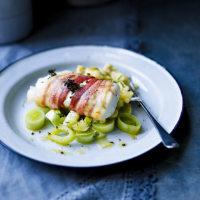 Wrap each fillet in 2 rashers of bacon and place on top of the leeks. Grill for 8–10 minutes until the fish is cooked through and the bacon is crisp. Drain the cooked potatoes and squash with a fork. Stir in the lemon juice, remaining olive oil and chives. Season and serve with the fish and leeks.